Reinventing our visual identity is an opportunity to start a new phase by communicating a fresh approach across the Anna Lindh Networks and projects. 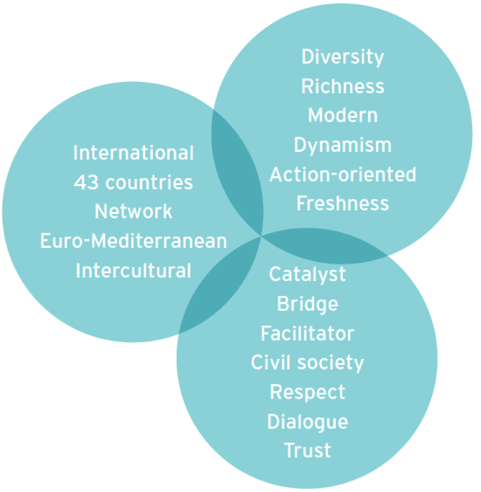 The nature of ALF as a shared institution between Europe, Arab countries, and Mediterranean countries. The role of the foundation as a catalyst in civil society. The characteristics that the new visual identity should reflect as fresh and action oriented. The clear role of the foundation as a catalyst in civil society is clearly reflected in the new logo with the use of diverse shapes and colours all coming together in a circle symbolizing unity.